Our homes are a significant investment that require continuous improvements. 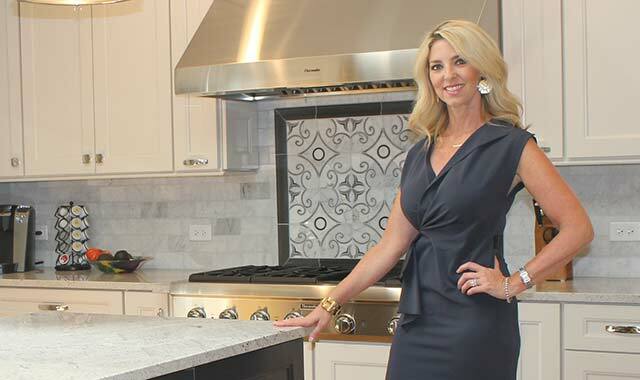 Step inside the mind of designer Robin Liberatore as she shares her thought process of remodeling homes. Robin Liberatore, designer with McDowell Remodeling in St. Charles, can transform any room of a home into a brilliant, cozy space. Robin Liberatore is an artist. The designer with McDowell Remodeling, 521 W. Main St. in St. Charles, walks into a room like a painter approaching a blank canvas; she sees a room not as it is, but as it could be. Liberatore holds a versatile set of skills on a team whose specialty is home improvement and light commercial property remodeling. Armed with experience earned while running her own interior design/build company in New York, Liberatore has the know-how to transform a property on-budget and on-time. She loves everything about the home redesign world – except maybe the plethora of made-for-TV home remodeling shows. There are lots of home remodeling shows on TV. Can homeowners get good ideas from them? If I can be honest, I hate home remodeling shows on TV. They give a false sense of timelines and budgets, and the project is not always done the “right” way. It’s finished for TV. The one plus to these shows is that they do keep people up-to-date on trends and provide ideas for what homeowners might like. If I had to pick my favorite show, I like HGTV’s “Fixer Upper with Chip and Joanna.” She has great style, and they seem to be a little more on the realistic side of remodeling. You’re a designer for home remodels. What exactly does that mean? I actually select every single feature of the design process. From flooring and cabinetry to countertops, the plumbing fixtures, intricate tile designs, the backsplash, the paint colors – everything – until it completely comes together and replicates my vision. Probably the most difficult is making sure it all gels together cohesively, because you’re dealing with many different elements. Whether the project involves moving walls or just reconfiguring the space, it’s important to convey your design goals and make it visual for the client. CAD and other design programs are so valuable to conveying your vision to a client. What do you bring to a home remodeling project that an interior designer alone can not? I took continuing education courses in electrical codes and have a vast knowledge of the complete construction process, from beginning to end. I also think it’s refreshing to have a woman on the construction site who can walk the walk and talk the talk. I like to be creative. Sometimes, doing the same thing day in and day out becomes mundane, but in this profession, each project is different. We’re in an industry where we’re actually artists. From the thought process to the design, to the carpenters and their artistic skill, we create a masterpiece. How do your experience and background help to create a deeper design process? I think the experience helps me to relate to the carpenters and all the trades involved with the project. Having the knowledge and understanding of what will and won’t work is imperative to the job running smoothly. As much as we don’t like to tell a customer no, sometimes what they want is impossible. I have seen some designers who have expectations of the carpenter or tradesmen that are unrealistic. Keeping a realistic vision of what is possible in a space is crucial for the project to be completed smoothly. What should homeowners know before undertaking a remodel? It is not an easy process. There are highs and lows of remodeling. Your house is dusty; you’re without a bathroom or kitchen for an extended period of time. You have people in your house at all times. And there are a lot of mechanicals that need to get done before it looks like anything is actually happening. So, homeowners tend to get antsy. Keeping a tight schedule, and making sure all the subcontractors and carpenters are complying with the schedule, is imperative. When the client has an end date in sight, that usually keeps everybody happy because clients want it done the day the project starts. I get it – it’s exciting. What are some common pitfalls to avoid in a remodel? Many people don’t look into or research the individuals who are responsible for the project. This is your home and you need to protect your investment. It is much less expensive to hire a professional than it is to hire an amateur. The professionals will end up coming back and fixing what goes wrong. What spaces are most often updated these days? I would say the majority of my remodels right now are kitchens and baths. Most of my clients are committing to staying in their homes and that is an equitable investment for an older home. Plus, you end up with a gorgeous updated space to use. One design that I am actually finishing is called a wet room. It’s a combination glassed-in area in your bathroom that contains your shower and your freestanding tub. It’s very spa-like and is a very progressive design. I love it when a client will allow me to be adventurous. As scary as it seems, the client ends up ecstatic about their decision. What’s a quick redesign that most houses could use? I think the quickest and easiest rehab for any room is a clean coat of paint. Neutrals throughout a house are huge now. White trim molding and doors can update a home by 20 years. What’s the most challenging room to redecorate? I haven’t met that room yet. By far, the looks on clients’ faces when they see the finished project. I can visualize the finished project as soon as I walk into the space, but it’s hard to convey what it is you are thinking and feeling for their project when we’re first getting started. There is a lot of trust from a client, so the synergy must be right between myself and the customer. At the end of the project, when the last coat of paint is drying, the silence and smile they have, while taking in the space, is all I need. Tell me about a time when the customer was especially satisfied. We did a project for a family with a disabled daughter in a wheelchair. The challenge was to open the floor plan, make the home more ADA (Americans with Disabilities Act) compliant for their daughter, still have it look like a gorgeous remodeled home, and to build it out while the family of five was still living in the house. Needless to say, it was challenging for us, trying not to disrupt their lives while affecting every room in the house. And it was challenging for them, too, because every day they were dealing with a house full of people and construction dust while taking care of their daughter, who thought it was more fun than anyone. On my final walk-through, as we were inspecting every door and every inch of the project, their daughter wheeled into the kitchen, parked herself sideways along the cabinets and, with her own hand, opened the easy open/close drawer and helped herself to a snack for the first time. Her mother nudged me and said, “That made it all worth it.” It was a very touching and rewarding moment. This entry was posted on Friday, July 29th, 2016 at 11:59 am	and is filed under Home & Garden. You can follow any responses to this entry through the RSS 2.0 feed. Both comments and pings are currently closed.